Although MacDonald's is a well-known, world-wide fast food chain, the varieties in it's menu can vary quite vastly from countries to countries, with the differences in local food preferences. To be honest, the breakfast menus served in Austria are rather unappetitising for me. However, with some recent additions to it's breakfast menu, I decided to give it a try. 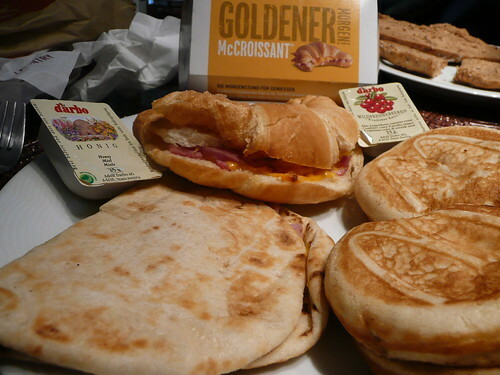 McToast was disappointingly thin and doner kebab-like except that the fillings consisted of melted cheese and ham slices. Sweet McGriddles is not foreign to me since it was already launched some time back in Singapore. It is basically a thicker, sweet pancake. Not having tasted any in Singapore, I could only say that the ones here are ok but it would be nice if they could also launch the normal plain hotcakes. McCroissant was also kind of disappointing too. It looked like a normal croissant and if not for The Hubby's effort to peel it open, I would have scolded him for being cheated by MacDonald's in bringing home a normal croissant! The fillings are the same as that in McToast. So to sum things up, Singapore still serves the most appetising MacDonald's breakfast by far for me!